Shopify Website. Shopify website is a web that allows you create, grow and manage an online store. It is advisable for both small and medium businesses. 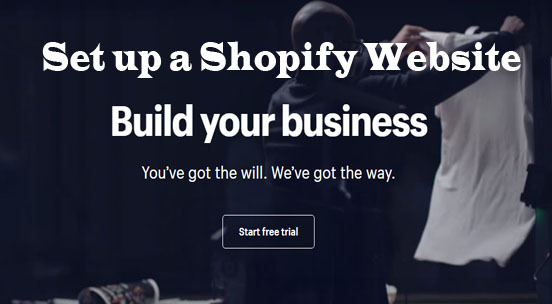 Shopify is an E-commerce platform that is designed to help you start, build, grow and manage a business with numerous in-built features and tons of apps. It is an online home for your business. It can be used to create blogs, publish the blogs, create webpages and sell your goods and products with attractive templates and a personalized domain name. Shopify offers comprehensive web builders complete with hundreds of templates ready to go right out of the box. It offers a 14 days free trial for you to have a first class experience with the website. Shopify is an online store that is very easy to use, all you need to do is creating your store, upload the products you want to market, product quantity and the shipping orders. You also have to include quality images of the product you want to sell. After that, you move on to choosing the marketing channels and where you want your products to be listed. Before you can use shopify, you must have a store with the site. To create your shopify store, go to shopify’s website and follow the instructions below to create your store. Proceed on to www.shopify.com on your browser. Click on the ‘Get started’ tab on the right side of the platform. You will be directed to a new page. On the page you are taken to, fill the form with the correct information like your email address, password and the store name you wish to use for your brand. You will be taken to a new page. Fill the form ‘Tell us a little about yourself’ with the right content. Then click on ‘Next’ or click on ‘Skip’ if you do not wish to fill the form. It is Optional. You will be directed to a new page, a new form ‘Add an address so you can get paid’ will be displayed. Fill the form with the right information and click on ‘Create my store’. If you followed these steps above, you will be automatically directed to your store. If you already have a store that was logged out and finding it difficult to get it back on, all you need to do is follow the simple steps below to get back on. On the platform displayed, click on the ‘Sign Up’ tab. Fill in your ‘Store address’. If you fill in the correct address, you will be redirected to your store.